You can learn a lot from watching The Walking Dead (TWD), and not just how to survive a zombie apocalypse (Hint: Always stay with Rick and Daryl). 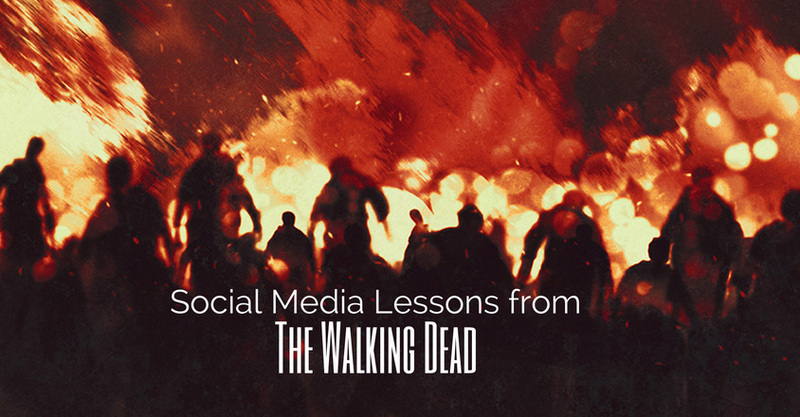 Believe it or not, TWD teaches lessons that are critical for social media. 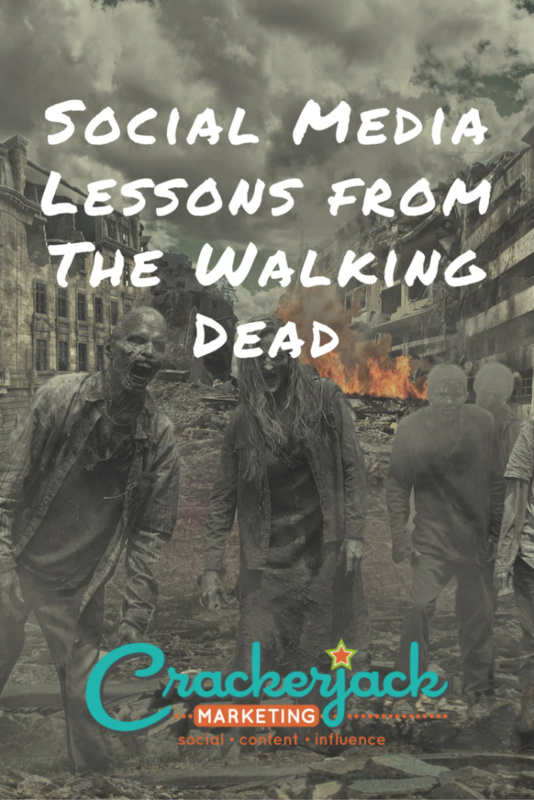 Here are 5 social media tips you can take from TWD. The poor characters of TWD never have it easy. Just when they see light at the end of the tunnel, bam! Here comes something or someone nasty to ruin it all. How many times have we gasped because the road or route the group wants to take is blocked by walkers, fallen trees, disabled vehicles or dregs of humanity bent on having our heroes for supper. What do they do? Well, sometimes they have to plow ahead, but the results are usually much better (and less bloody) when they have an alternate route for reaching their destination. The same can be said in social media, especially in light of the latest Facebook EdgeRank apocalypse. If you can’t reach your destiny (eg. Target audience) through Facebook, find a different route. Remember, Facebook is just one of your options. Here are some of the other roads to take when a hungry zombie (eg. 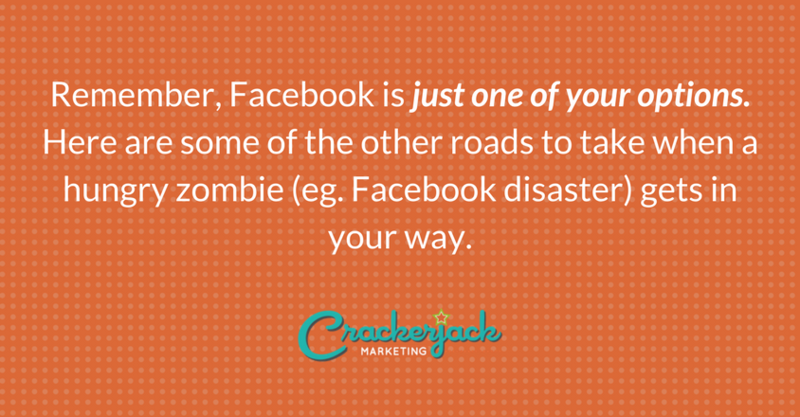 Facebook disaster) gets in your way. Twitter has over 215 million active users, with the average user spending close to 3 hours there every day. LinkedIn has more than 270 million users, so if your journey includes B2B, this is the place to go. Google+ boasts over 250 million active users and offers cool tools for marketing and collaboration, such as Hangouts. Pinterest has over 20 million active users, and yes this is less than the three above, but it’s growing every day. Let’s face it, people love to pin. The point? Find out where your audience is and get yourself over there, even if it’s not (or isn’t only) Facebook. You can’t wait to strike a walker. If you hesitate or spend too much time saying “I won’t,” when you really just kind of have to, chances are pretty good you’re going to become someone’s snack. The same can be said for customer service in social media. Don’t over-analyze the situation. Respond quickly. And always remember that it’s not only important to act but also critical that you take the appropriate action. In TWD, it’s not always smart to fire a gun at a stray walker. That could bring the whole horde on. Instead, act quickly, but do apply common sense (Use that ax, friend). Forbes offers 7 Reasons You Need to Be Using Social Media as your Customer Service Portal. And don’t make the mistake of thinking consumers aren’t expecting to reach you this way. According to J.D. Power and Associates, almost 70 percent of consumers have headed to a business’ social media page to get the help they need. And so does negative chatter on social media. Walkers hear another walker chowing down, and they want to get in on all the action. They hear a scream or a few too many loud chews, and suddenly they’re everywhere. People are essentially the same. They have noses that sniff out negativity online, even if only to find out which products or services they should avoid. And, sadly, it only takes one person to start a firestorm of negative sentiment. Have a plan for monitoring chatter through a single dashboard (just makes your life easier). Set up alerts to inform you right away if certain words or hashtags are used in relation to your company. Respond quickly (see Point 2 above), keeping honesty and transparency priorities. Sure, Rick is the group’s recognized leader but he often takes the advice of his fellow zombie-apocalypse survivors in determining the next move and strategy. Your social media strategy shouldn’t rely solely on one person either. Remember how things were with Rick after he lost Lori? Dude kind of shut down, and who could blame him? When it comes to your business, you don’t want to be stuck scrambling because your social media genius is down and out. Focus on having a whole team of brilliant people who can (and consistently do) rock and roll at a moment’s notice. Need some tips for assembling your TWD-worthy dream team? Check here. Part of what makes TWD so exciting is the fact that you never know what’s waiting around the corner. You just know that something is waiting. The same goes for social media. How so? Well, the thing to remember is that social media is a two-way street. You need to participate (engage, interact, rinse, repeat), but so do your fans. In many ways, you are putting your brand in the hands of your fans. Sometimes they will surprise you in delightful ways; sometimes the surprises will be far from pleasant. What you can count on is that they will surprise you. The takeaway from this? Just as our TWD heroes can’t always prepare for the worst (that revolving door scene–poor Noah), you can’t always stay ahead of the game. But that doesn’t mean you have to become walker food. Make a plan, do the best you can, and like Daryl, always be ready. Carol’s no slouch either. That chick is a survivor, come what may (well so far). Consider yourself lucky there aren’t walkers waiting for you around every corner. Because, really, who has time for that while running a business? Still, it pays to be prepared and stay strong. Things do get dicey out there in social media land. The above TWD tips will see you through.